Tigers make it a grand slam in week six. 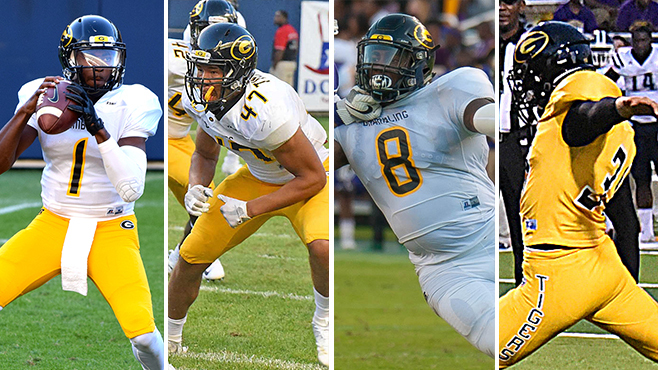 BIRMINGHAM, Ala. – Grambling State swept the SWAC Football Players of the Week honors in week six as senior quarterback Devante Kincade, sophomore linebacker De’Andre Hogues, redshirt sophomore defensive lineman Anfernee Mullins and redshirt junior Marc Orozco were all named the Southwestern Athletic Conference Football Players of the Week for their outstanding play. Kincade threw for 265 (14-of-23) and three first-half touchdowns as Grambling State picked up its fourth straight State Fair Classic with a 34-21 win over Prairie View A&M. Kincade was 9-of-13 in the first half for 226 yards and three touchdowns (16 yards – Darrell Clark; 29 yards – Darrell Clark and 12 yards – Lyndemian Brooks). His three touchdown passes aided the Tigers to a commanding 31-7 halftime lead. Hogues finished with five tackles, including three sacks for a loss of 24 yards. Also, he forced a fumble in Grambling State’s 34-21 victory over Prairie View A&M in the State Fair Classic. Orozco accounted for 10 points and he booted two 40-yard field goals and was 4-of-4 on extra points. His first field goal gave Grambling State a 10-0 and his last came in the third quarter, which gave Grambling State a 34- 14 lead. Grambling State defeated Prairie View A&M 34-21 in the State Fair Classic. Mullins, who played in his first game of the season, led the Tigers with six tackles, including three solo stops. He had a pair of sacks for three yards and 2.5 tackles for a loss of 10 yards. Grambling State defeated Prairie View A&M 34-21 in the State Fair Classic.